I’ve been a volunteer in medical studies for decades, so i have a long history as a lab rat, but it is very rare that they give you any information about your results, if for no other reason than that all the better studies are double blind, so they don’t know any information about you. Your reward is getting to feel good about yourself as a volunteer and, in my case, getting to brag for decades about being in the cohort of volunteers in the late seventies who participated in the development of the vaccine for hepatitis B. In recent years, though, a number of the studies i’ve been in have offered a nominal payment, so after you’ve completed the tests, they give you an envelope with a twenty dollar bill in it. I always tell ’em i’m not doing this for the money, but somehow i always end up pocketing the envelope. I’m currently volunteering in a VA medical study of the mental decline of veterans with AIDS, which has been quite interesting. Last fall the doctor running the study offered to do an analysis of the current state of the mental health of any of us who wanted it, perhaps out of gratitude but probably because this would give her more detailed information about a subset of her subjects. In the case of this particular study, i’d already been handsomely rewarded. They had given me an Apple I-Pad to use every six months at home for the follow-up testing…and to keep after the study has run its course in a couple of years. So the offer of something more was bit embarrassing. Not so embarrassing that i refused her offer. Even though my internist is up to the minute on all the latest AIDS developments and provides me superb care, it would still be nice to get a second opinion, one focused on my mental health. So i said yes and set up the appointment. Three weeks ago i drove down to the doctor’s office in the Palo Alto VA hospital, handed over the paperwork for my latest blood tests, and did a couple of hours of mental tests under the supervision of one of her assistants. Then i saw the doctor, who performed a physical exam, put me through some physical tests, gave me a couple more mental tests herself, and then grilled me at some length to determine my current grasp on reality. I knew who was president and could name my local politicians. I also knew what day it was and where i was although i lost points for not being able to name the county Palo Alto was in. Which i still gnash my teeth over. I couldn’t help noticing that she had clearly worked in medical research all her career. Bedside manner? Oh please, just the facts. When she was done, she briskly thanked me for being one of her volunteers and told me she’d send me a copy of her written analysis. I got it the other day. The result: I show no signs of Alzheimer’s disease and my only cognitive impairment at this time is the normal decline to be expected in a man my age. This is quite a relief since i’ll no longer view forgetting some trivial something as Alzheimer’s wingèd chariot drawing near. And besides, i can now prance around calling myself a very stable genius. Ummm, or at least very stable. 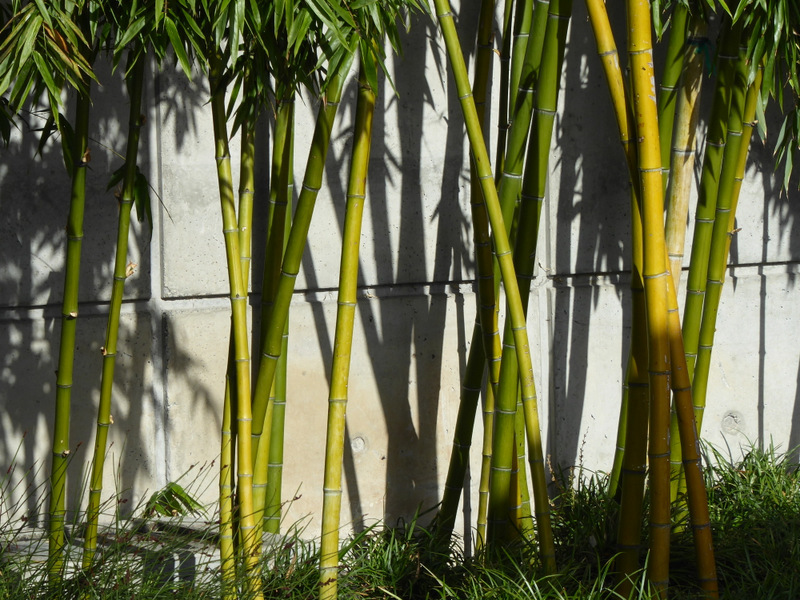 Meanwhile, here’s a swath of sideways January sun on some Market Street bamboo. Well, we all knew you were a genius! Nice that you had further confirmation on the matter. Great photo. Well, thanks. All i was doing was just sharing what my staff had told me. And the air last Saturday morning was so crystalline that photo ops were jumping out at me all the way down Market Street. All i did was point and click. San Mateo County? Maybe Santa Clara. If Trump’s a genius, you’re a cross between Einstein, DaVinci, and Shakespeare. I knew it wasn’t San Mateo but guessed San Jose, which of course doesn’t exist. It’s Santa Clara. I would definitely have missed the question about my local politicians… All of them. I’ve no idea. Hmm, my bad, I should read the news more often… I know the governor. Does that count as local? Great news and another awesome photo! Well luckily she didn’t ask for my state legislators because i knew only my senator. Luckily she asked only for my state senator, my national senator, and my mayor.